The death camps of Nazi-occupied Poland are an unlikely travel destination; the human atrocities of the Holocaust are beyond disturbing. Yet 10 students from Wilfrid Laurier University chose to confront this dark chapter in European history with a spring 2017 field course led by Associate Professor Eva Plach to understand Poland before, during and after the Holocaust. Plach, an associate professor in the Department of History at Laurier’s Waterloo campus, knew that an experiential learning opportunity examining the extermination of approximately six million Jews from across Europe would require added consideration. She prepared the students, who came from varying programs in the Faculty of Arts, with two weeks of classroom instruction on Poland’s past and what to expect when on site at the camps, museums, memorials and cemeteries. Poland is crucially important to Holocaust history as it had the largest Jewish population in Europe at the onset of the Second World War in 1939. Plach says approximately three million Jews – or 10 per cent of Poland’s population – were among the six million Jews murdered across Europe during the Holocaust. She and her students spent 13 days visiting the cultural and historic sites in the cities of Kraków, Warsaw and Lublin. 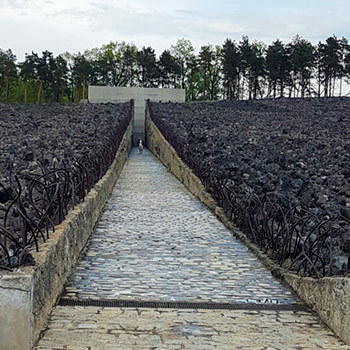 While in Kraków, the Laurier group partnered with faculty members at Jagiellonian University, who facilitated visits to various Holocaust-related institutions and sites in southern Poland, including the death camp, Auschwitz. The students’ tour of Lublin, in eastern Poland, began with a visit to Grodzka Gate–NN Theatre Centre, which offers educational programming to commemorate Lublin’s Jewish history. The Grodzka Gate, also known as the Jewish gate, is an archway that marked the passage into Lublin’s Jewish quarter – a cultural hub during Poland’s interwar period. The Nazis tried to erase this Jewish culture by murdering Lublin’s 43,000 Jews and destroying large parts of the city. Visitors to the centre can walk through the gate while trying to envision what pre-war Lublin was like. Open spaces near the actual gate, like streets, parks and parking lots, exist where Jewish homes and synagogues once stood. A pre-war streetlamp remains lit at all times inside Lublin’s once-Jewish quarter in memory of those lost during the Holocaust. Negotiating history and memory was a topic that filled the 13 days in Poland for Plach and her students, and despite the sadness that comes with talking about Grodzka Gate or the death camps, Parnis says she and her classmates sensed an immense amount of joy and hope in Poland. There was also a service-learning component to Plach’s course. She took her students to Kraków’s New Jewish Cemetery, one of many Jewish cemeteries in Poland that was destroyed during the war and never fully restored. The students spent a day weeding around the headstones, sweeping debris and removing dozens of bags of garbage. “It was humbling for many of us to be in that beautiful, lonely space and to actively engage with the past in a practical way,” says Parnis. As a history student, Parnis can’t help but stress the importance of remembering the hundreds of years of Jewish culture that existed before the war, and to recognize the ongoing – albeit slow – rebirth of Poland’s Jewish culture.